One of the continuing difficulties executives face is this ‘strategy-to-reality’ gap – the difference between desired strategic outcomes and actual business value realization. Often the best efforts fall short because in the haste to start doing rather than planning, organizations unknowingly make critical mistakes forming the project portfolio and setting up large strategic initiatives that considerably lower their odds of success. While many organizations use an enterprise PMO (ePMO) to deliver strategy, business value realization remains marginal. Many ePMOs underperform against desired expectations, functioning more as ‘order-takers’ than strategic partners that drive business value. How do you move from a low-performing program office to a high-functioning ePMO—or create one—in a timeframe that keeps pace with your business demands? A well-formed ePMO has one mission in life: to generate business value through the excellent execution of strategic initiatives. In short, ‘to move the needle on key business metrics’. How is this possible given the devastating failure rates mentioned earlier? The odds of successful strategy delivery can be substantially increased by taking a different approach. These five pillars provide the framework from which to build or improve your ePMO. Each pillar represents a set of capabilities that successful ePMOs mature over time. The key to successful evolution is not doing too much too fast, but rather advance at a pace the organization can absorb. Unfortunately, many ePMOs try to go too fast and as a result, overwhelm the organization with unnecessary sophistication with too many complicated templates and processes. It generally takes three years to achieve three levels of maturity, so taking a measured approach with periodic review and adjust cycles works best. 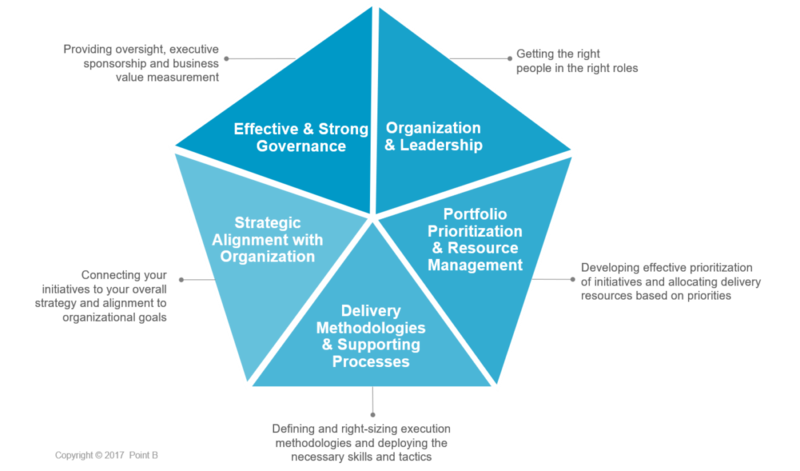 Portfolio risk management is one essential ePMO capability. Taking on too much or too little risk in the project portfolio can have a similar outcome – failure to achieve strategic goals. Balancing project portfolios requires defining the amount of risk executives are willing to accept, but it doesn’t mean eliminating high risk initiatives altogether, as they may be the key investments that transform the organization. Large complex programs fail for predictable reasons. Common pitfalls include lack of stakeholder alignment, lack of business readiness, and lack of well-executed delivery. Overcoming these pitfalls require the art of leadership more so than the science of project management. For example, influencing a stubborn stakeholder, navigating political waters, or aligning stakeholders on initiative success measures, all require strong leadership. Unfortunately, many ePMOs grossly underestimate the people side of initiative leadership, believing that a project or portfolio management tool is the silver bullet for strategy delivery, but no tool is going to save you. Tools are no substitute for leadership. The key to successful evolution is not doing too much too fast, but rather advance at a pace the organization can absorb. Unfortunately, many ePMOs try to go too fast and as a result, overwhelm the organization with unnecessary sophistication with too many complicated templates and processes. Initiative leaders also can’t go it alone, as the complexity of a large scale initiative is too much for any one person to manage. Using the concept of ‘distributed leadership’, which is getting exceptional leaders in the right roles, will create leverage and leadership capacity for initiative owners. A high performing ePMO can serve this purpose, by how it partners. Being service-oriented, objective, keeping the best interests of the initiative leader and organization at heart, and being a trusted problem solver, will result in successful outcomes and minimize the fatigue that multi-years efforts generate.